Two months after taking over the role of CEO at ViiV Healthcare, Deborah Waterhouse found herself involved in what would soon become a significant business milestone in the 10-year old company’s history. It was June 2017 when Waterhouse and other executives from ViiV and GSK decided to redeem an FDA priority review voucher for Juluca, a single-tablet antiretroviral regimen of Tivicay and Edurant for maintenance treatment of HIV-1 infections. (ViiV Healthcare is a joint venture between GSK, Pfizer, and Shionogi.) The voucher, for which the companies paid $130 million, allowed for an expedited six-month review, shaving at least four months off the standard approval timeline. 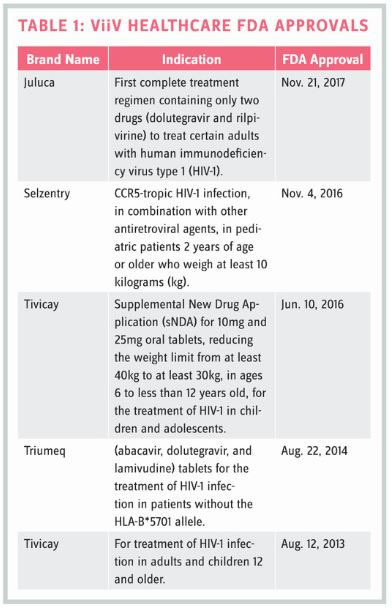 Then, a little over a year later (October 2018), another priority review voucher was used when ViiV submitted an NDA to the FDA for a single- tablet, two-drug regimen of dolutegravir and lamivudine for the treatment of HIV-1 infection. Submitting two priority review vouchers within a year of each other isn’t exactly common — or easy — and obviously indicates ViiV Healthcare’s commitment to getting new HIV treatments to market quickly. But that goal isn’t anything new for ViiV; the company already had launched three new HIV drugs and gained five FDA approvals (see Table 1) before Waterhouse became CEO. Nevertheless, after looking at her background and career path, there’s no denying that Waterhouse is a good fit to lead this company on a path that will likely lead to additional important milestones. Another innovation example she gave pertained to fostemsavir, an asset acquired a few years ago from Bristol-Myers Squibb that is in development for heavily treatment-experienced (HTE) patients with HIV-1 infection. These are patients who can no longer construct a viable regimen, which means they have the potential for their virus to progress to full-blown AIDS. While a very niche product, fostemsavir still represented a signifi- cant unmet medical need. But as the company continued its development, it was discovered that there was a photo sensitivity issue in the manufacturing process. This created huge challenges for ViiV scientifically and technically. “We ended up paying to build a segregated manufacturing facility where GSK can manufacture the product while working in very low light,” she explains. This required putting a special film over the windows to let only a small amount of light in through color filters. While it isn’t quite as dark as working in a darkroom to develop photographic film, Waterhouse says it’s not far off. Having overcome these challenges, the company anticipates launching sometime in 2020. The last primary focus area for Waterhouse is performance. “We need to deliver to our shareholders, so they remain willing to invest and we can continue bringing accessible innovations to patients,” she states. “Our shareholders appreciate innovation, and at a practical level, expect us to show them how new medicines are going to bring a return on their investment.” A great example of this was ViiV Healthcare’s decision to move away from developing new oral, three-drug regimen antiretrovirals, as these have been the standard of care since the 1990s. Instead, ViiV seeks to turn the HIV treatment paradigm on its head by developing regimens containing only two drugs. “Over a lifetime of treatment this could reduce a person’s drug exposure by 20,000 doses,” the CEO asserts. “We now have the data showing that two drugs can be as effective as three, and this year we’ll launch a new, oral two-drug regimen in the U.S. and Europe.” As ViiV has delivered the data in support of two drug regimens, shareholders have continued to invest, allowing for a virtuous circle of innovation. Another advantage is related career advancement, which is also related to having GSK as a main shareholder in the JV. Say an employee wants to move into a commercial leadership role or something in government affairs or communications, yet there isn’t a current opportunity available within ViiV. According to Waterhouse, “In these instances, we encourage people to rotate into GSK — where more positions may be available due to the size of the organization — to gain such experience. That provides continuity of employment between our two organizations.” She notes, however, that the same rotational employment opportunities do not exist between ViiV and Pfizer or Shionogi. That connection with GSK has other big advantages when it comes to growing ViiV. For instance, in September 2018 ViiV acquired GSK’s HIV Discovery Performance Unit, thereby transferring all current GSK HIV development programs to ViiV. This acquisition makes ViiV Healthcare a true end-to-end company, as it now covers the HIV continuum from discovery through care. At the heart of this acquisition was Qura Therapeutics, a public-private partnership dedicated to finding a cure for HIV, and now jointly owned by ViiV and the University of North Carolina at Chapel Hill. Waterhouse knows that it’s developments like these that she needs to continue to seek out and foster as CEO of ViiV Healthcare. After all, HIV is a difficult virus to cure and a difficult therapy area to focus on for any size biopharma. She says she’ll have to continue to leverage her past career and personal learnings to continue to move ViiV forward to finding a cure for those millions of patients living with HIV. “Perhaps there will come a day when a person with HIV only needs an annual or biannual treatment to achieve and maintain remission,” Waterhouse concludes. Waterhouse says if you were to talk to her daughter, she’d tell you about the seven different schools she’d been in before the age of 16, along with highs and lows that come along with relocation. “The biggest challenge was balancing work life with everything associated with a growing family,” Waterhouse admits. Five years before taking her current position, Waterhouse’s family moved from Melbourne, Australia, to London, England. 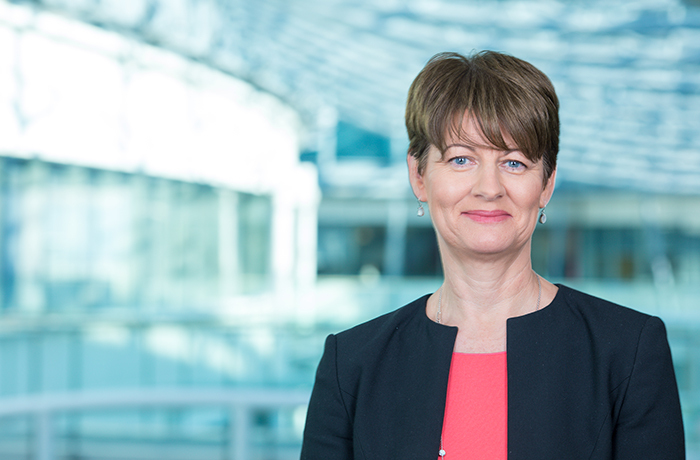 The following year, in 2013, her family once again faced the prospect of a cross-continental move, as Waterhouse, a GSK executive, had received a compelling offer from her company. Changing schools for children can be emotionally difficult as it is, but relocating across the Atlantic to a new city in a new country after having settled in only a year prior … well, that can challenge any family to its core. Add to this the fact that her husband, Lloyd Bender, an ophthalmologist, had just gotten his career reestablished. Oh, and here’s one more important piece of information: The family didn’t have the luxury of time. That’s because, when sitting down to discuss the “Do you want to move to America?” question, they decided, if opting to make the move, their two kids needed to start school on the very first day of the new school year. This meant only six weeks to get visas, relocate to Philadelphia, and find and enroll in a new school. And that’s only if they could decide right away. As the family had a previously arranged holiday to go to Costa Rica, they decided to add three days to the beginning of the trip to visit Philadelphia and gather information. Although they did have the help of relocation specialists and were fairly experienced in the international relocation and school search department, another big move wasn’t something taken lightly. The family spent three days looking at 17 houses and six schools, and ended up picking the Shipley School, an independent, coeducational day school in Bryn Mawr, PA. Then it was off to Costa Rica, where Waterhouse recalls relaxing on the beach — filling out visa applications.